Avoid springtime regrets – plant your bulbs now! Every year we remind you that fall is the only time you can plant those wonderful spring-blooming bulbs. Plan ahead and you will be the envy of your neighbors next spring! 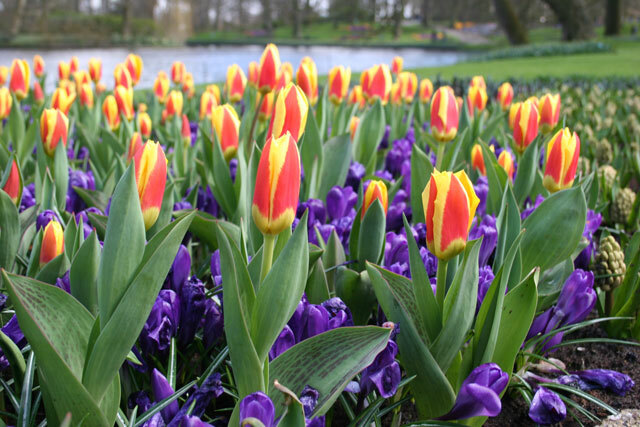 Tulips, daffodils, crocus, hyacinth, alliums and more are waiting for you. Bulbs are an investment with a payback of years and years of springtime beauty. When you plant your bulbs is the perfect opportunity to dig in a generous amount of plant food. It’s the only chance you will ever have to get the nutrients the bulbs need for maximum flowering directly under the bulbs in the root zone of your plants. Bone meal is the perfect supplement to add to your bulbs when planting. Do you agree that a bigger egg makes a bigger omelet? Well it is the same with bulbs. The bigger the flower bulb is, the bigger the flower will be! But the resemblance goes further than that! Like eggs, bulbs are graded by size before they are sold, with the larger ones fetching the highest price. The smallest bulbs, which have not yet stored enough energy to produce flowers, are sold in large amounts for low prices, often by mail-order magazines and big-box stores looking to keep costs low. At Hillermann’s, we only stock bulbs big enough to produce flowers right away in their first spring.